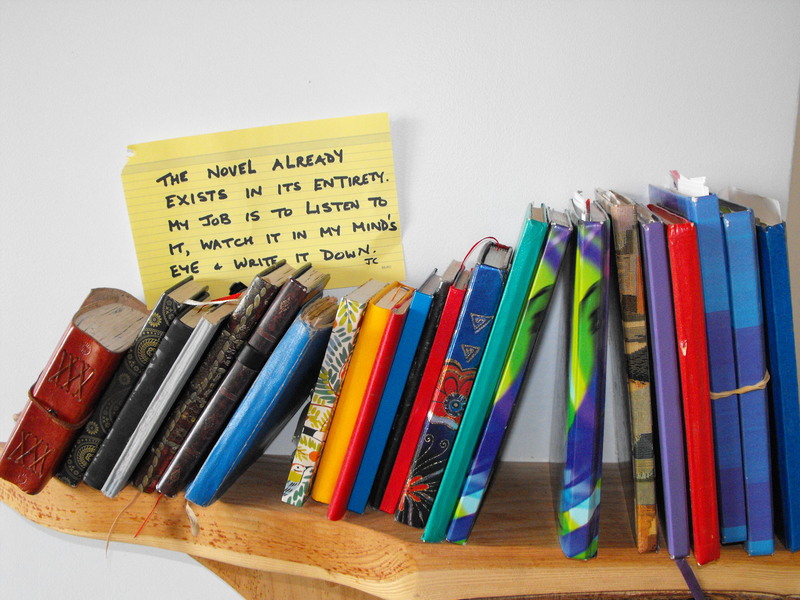 I’m a notebook lover – no, not the film, the items that you write in. I have a stack of them, collected since I was fourteen years old, so it’s a long-time addiction. I love the feel of them and the look of them, even the smell of them, but above all I pay homage to their raising-agent qualities. Raising ideas into stories, that is. Yes, for me, it’s a case of notebook leaven as well as notebook heaven. A quote from one page mixed with a snippet from another can spark a character, a poem, a play, a novel… the potential is endless. It is synthesis that leads to genesis and magic that I’m thankful for. I doubt that I wrote anything of significance in them that early on but the compulsion to fill blank white pages was there even then. 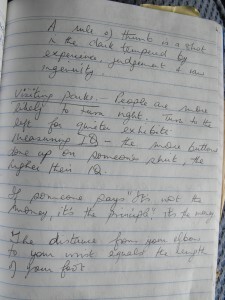 Since then there has been joy in the choosing and the using of notebooks, in the dipping into and the drawing out of what are often ‘well’ books of inspiration. Every so often I take a squint back through the stack (some of them pictured here) and it’s usually a worthwhile experience. I re-live old thoughts and observations and put discarded ones back under the microscope. There’s joy, too, in seeing the ones that fermented from abstraction to the reality of completed stories. Let me take you on a tour after my last look, see and remember. It’s a mish-mash magpie collection but that’s what notebooks are for. A lot of what I jot down is overheard dialogue. That’s because I love listening to people speak – what they say, that they don’t say, the vocabulary, the sentence structure, the rhythm, the emphasis, euphemism, the silence…it’s all valued grist to the mill. It’s not surprising, then, that there is a quotation from Google doesn’t know where in a 1986 notebook about dialogue being the nerve end of feelings. Too right. That about sums it up for me. When I jot something down it invariably leads to other triggered thoughts that are then – guess what? – jotted down too. Here are some examples. Most are from rural people as that’s the world I live and breathe in. He’s so quiet it’d take a poultice to draw him out of himself. This last one set me thinking about how long it was since I’d heard the word ‘poultice’ and how poultices were made out of bread or soap and sugar to draw out infection. I add a note now about how I’d forgotten that schoolchildren often had boils and sties on the eyes in the past, unlike nowadays. That brought me nicely to another quotation from another notebook about nostalgia being history with the pain taken out. And I’m still thinking about that man who was so quiet that.. And why, exactly, he was like that. For some reason I also kept a list of rules for politicians going on TV. I’ve no idea why. They’re not supposed to wear thermal underclothes, the note said, as they would ‘roast in the studio’ – and ‘no dotty ties’ (dots undermine credibility apparently). There’s an unattributed quote, too, about ‘the Ladies’ being ‘the cheerful centre of an underground current of bitchery, gossip and feminine solidarity focused on the readjustment of underwear and repainting of faces’. Then, in another notebook there’s a list of ‘things that ‘couldn’t be got during World War II’. Lack of rubber tyres was one that affected my father sorely. Somewhere else I’ve jotted down a good name for a maternity clothes shop – fashion after passion. 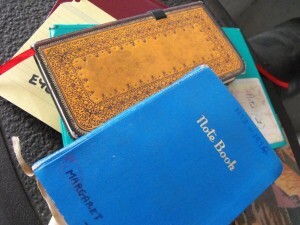 Then there is a note about Germoline and how I never liked the smell of the salmon-pink ointment and how I was always fascinated, too, by how the colour of it was similar to my elderly aunt’s slip – more underwear – which brings me to another important purpose for notebooks, in case I forgot, as stores for future memoir material. Then there are the funny things my children said like son number two, at the age of five, seeing a field of sheep in winter -‘If you peeled them now they’d be freezing’. There’s a comment from a friend of his too, aged nine, who has a formal, modern name, about how he loved the sound of his school bus driver’s name – Paddy. Pad-dy. He liked Paddy the man too, he said, because ‘he spits out the window, lets big farts and belches and shouts ‘sit down in your seat’.’ I love the rhythm of that sentence. Then there’s a quote from a newspaper about how ‘you don’t grow up until you stop being someone else’s child’. At the time I wrote that in I didn’t know what it meant. Now I’m half way to knowing. Then there’s the quotation stating that ‘geneticists say that the biggest agency of change in the first 50 years of the twentieth century was the bicycle and I’m back, for some reason, in Ballroom of Romance land again and grateful that the gene pool got widened and wondering if the lack of rubber for tyres during the war caused a hiatus in that expansion. There’s also great joy from seeing the genesis of essays and stories that went on to be published. There’s a rhyme scribbled in that my grand-aunt Ess used to sing to us as she bounced us on arthritic knees – Jobby, jobby, little horse, how many miles to Dublin… – a memory that led to a radio piece. There’s a saying jotted down too from an elderly neighbour that always made us laugh. ‘Do you want long tea or short tea?’ he’d ask as he approached the table with the teapot blackened by an open fire. That ended up in a short story, Fond Farewell. Then there’s a letter cut from a newspaper in 1999 about forgotten people that led to Restless Spirit, each sentence read over and over until it drove me to find out more. 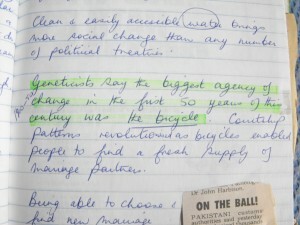 In a 2004 notebook there’s a sentence written in red ink – she wanted to see the whites of her father’s eyes. That became a driving image in the story that became Deny Me Not. And now I have to leave down the notebook look-through for the moment. I’ve been doing the scaffolding for that novel for months and next week is set aside to start spilling out the first draft. I look forward to the day when I’ll look back at that notebook and be able to write ‘Completed’ over the genesis jottings. Notebook heaven. Notebook leaven.